Ready To Serve Selection OF Naturally Smoked Seafood AND Cooked Shellfish. Ready To Serve. No Cooking Required. 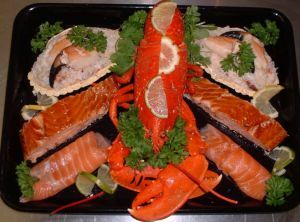 Contains: 3 x Freshly Cooked Whole Lobsters (1500g total weight) if you would like the lobsters dressed, order from THIS LINK, 6 Freshly Dressed Whitby Crabs (200g each), 6 x Oak Roast Salmon Steaks (100g each) and 600g of Oak Smoked Salmon. All weights approx.